Sidney's Hallie Westerbeck catches a popup during a Greater Western Ohio Conference game against Troy on Monday. 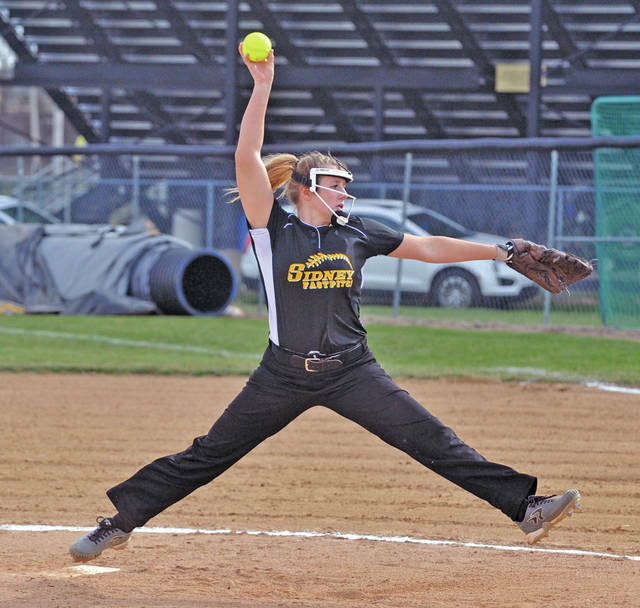 Sidney sophomore Lauren Barker throw a pitch during a Greater Western Ohio Conference game against Troy on Monday. Sidney's McKenzie Benshoff catches a popup during a Greater Western Ohio Conference game against Troy on Monday. 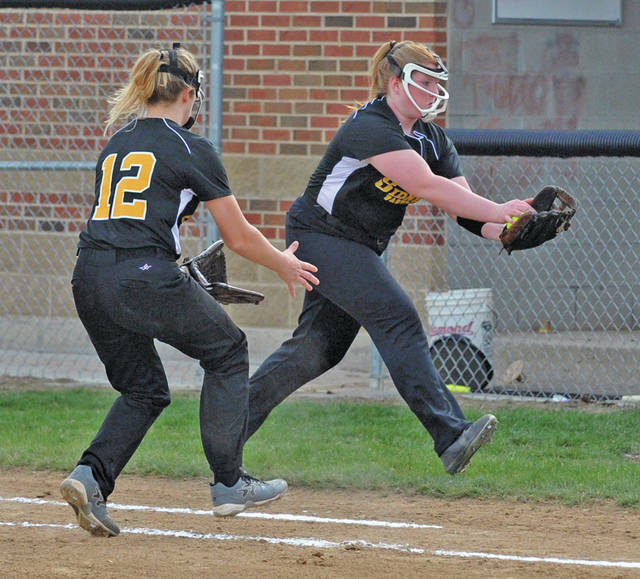 Sidney’s Alli Milanese, right, catches a popup in foul territory along the first base line during a Greater Western Ohio Conference game against Troy on Monday. SIDNEY — After beginning the season with nine losses in its first 10 games, Troy wants to give the rest of the Greater Western Ohio Conference American North Division something to think about throughout the rest of the season. After Monday, Sidney would believe it. Freshman Bri Lavender set the Trojans’ single-season record for triples and drove in four runs to help Troy take control, then pinch-hitter Lexi Piper crushed a two-run homer in the top of the seventh to put an exclamation point on the Trojans’ 10-5 GWOC American North victory over the Yellow Jackets on Monday at Sidney. With the win, Troy improved to 3-9 on the season and 2-2 in the GWOC American North — with those two losses both coming to division co-leader and defending champion Greenville — while Sidney fell to 2-6 overall, 1-3 in the division and dropped its third straight. A key component of Troy’s offensive punch this season has been freshman Bri Lavender, who led the team in batting average (.586) and runs scored (12) coming into the game. And she cleaned up against Sidney starter Lauren Barker on Monday, going 2 for 4 with a double, a triple and 4 RBIs. Lavender got things going in the top of the third. With the game still scoreless, Josie Rohlfs hit a two-out single and Paige Nadolny drew a walk, bringing up Lavender — who drove the ball into the right-center gap to bring home two runs on her sixth triple of the season. Tia Bass — the team’s leader in RBIs — followed that up with an RBI single to bring home Lavender and give the Trojans a 3-0 lead. In the bottom of the inning, though, Sidney’s patience — and Troy’s sudden inability to find the strike zone — allowed the Jackets to briefly take control of the game. Madison Osborne drew a one-out walk, Hallie Westerbeck singled back up the middle and Alli Milanese walked to load the bases. The previous inning, Troy starting pitcher Erica Keenan had been in the same situation but struck out the next two batters to get out of the jam, but this time she struggled to finish the inning off. Barker drew a walk to bring in a run, and Bass came in to pitch — but she walked Heidi Aselage and Jenna Smith consecutively to tie the score, and Keenan reentered. Destiny Harris hit an RBI groundout for the second out, and Aselage scored on a wild pitch to give the Jackets a 5-3 lead after three complete. All told, the Jackets scored five runs on five walks and only one hit and no errors. That was all Sidney could manage offensively, though, as Keenan settled in and only allowed two baserunners the rest of the way, retiring the final seven batters she faced, allowing four hits and five walks while striking out five. Troy, meanwhile, consistently found ways to bring in runs to retake control. Madelynn Lavender kicked off a three-run rally in the top of the fourth with a leadoff single, was bunted to second by Ella Furlong and scored on an RBI single by Jaiden Hunt. Megan Malott bunted Hunt to third, Rohlfs drew a two-out walk, Nadolny followed with an RBI single and the go-ahead run scored on an error off the bat of Bri Lavender to put Troy up 6-5 after four. The Trojans got a pair of insurance runs in the sixth. Malott beat out a bunt single with one out and Nadolny reached on a two-out error to set up Bri Lavender once more, who hammered a pitch over the center fielder’s head for a two-run double to give Troy an 8-5 lead. And in the seventh, after Madelynn Lavender reached on an error to lead off, Piper came on to pinch hit, went golfing for a low pitch and smacked the first pitch she saw over the fence in left-center, a two-run blast that made it a five-run game — plenty of breathing room for Keenan to finish off the game with. Barker took the loss for Sidney, allowing 10 runs — only five earned — on nine hits, three walks and one hit-batter while striking out four. Smith was the lone Jacket with multiple hits, going 2 for 2 with an RBI. The Wildcats picked up a run-rule Shelby County Athletic League win over the Trojans on Monday in Houston. Emilee Foster picked up the win in the circle for Houston. She had two hits (including a double) and 2 RBIs at the plate. Peyton New had two hits and 2 RBIs for Houston and Addie White had two hits. Courtney Sutton had two hits and a double for Botkins. 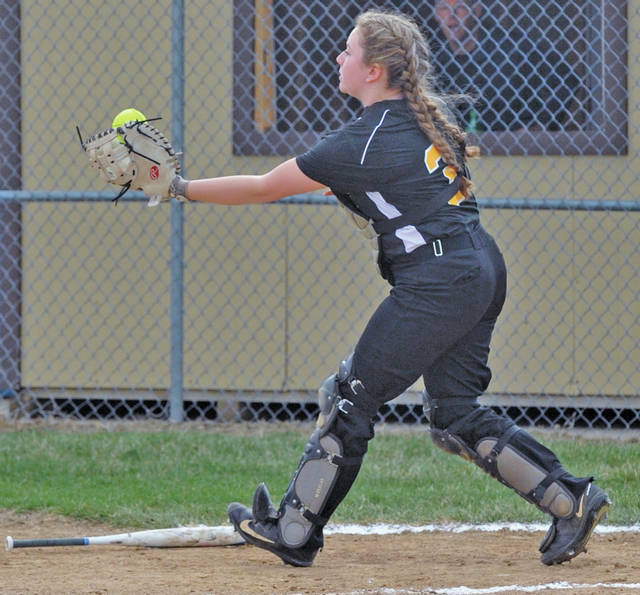 Despite out-hitting Anna, the Tigers couldn’t overcome four errors and lost in run-rule fashion in an SCAL game on Monday in Jackson Center. Anna had 10 hits and Jackson Center had 13. The Rockets didn’t commit an error. Carey White and Elaina Crosson were both 2 for 4 for Anna with 2 RBIs. Each hit one double. Olivia Place doubled and had 2 RBIs, Grace Maurer had 4 RBIs and Taylor Spence had a double. Crosson picked up the win in the circle for Anna while Kenleigh Fortner was charged with the loss for Jackson Center. Kiley Lemly was 3 for 3 for the Tigers while Grace Woolley was 2 for 3 with a double. Fortner was 2 for 3 with a double and 3 RBIs. Ashley Mullenhour was 2 for 3, Regan Davidson had 2 RBIs and Ally Russo had a double. After giving up four runs in the fifth inning, the Raiders scored two runs in the bottom half and added two more in the sixth to close out a run-rule SCAL win over Fairlawn on Monday in Russia. Russia had 17 hits and one error while Fairlawn had seven hits and three errors. Kennedie Goubeaux was 2 for 2 for Russia with 2 RBIs while Jenna Cordonnier was 3 for 5 with 3 RBIs and two runs. Olivia Moorman was 3 for 5, Ashley Scott was 3 for 4 and Riley Hammonds was 2 for 4. Cordonnier hit a home run, Jaycee Lewis hit a triple and Moorman, Hammonds and Kendall Monnin each had doubles. Sophie Francis earned the win for Russia. She pitched a complete game and allowed four earned runs. Skylar Jones was charged with the loss for Fairlawn. She pitched a complete game and allowed 11 earned runs. Lauren Dudgeon was 2 for 3 with 1 RBI for the Jets while Ashley Roush was 2 for 3. Madison Pierce hit a double and had 2 RBIs. The Redskins scored eight runs in the first three innings to take control and earned a nonconference win on Monday in Fort Loramie. The Redskins had 14 hits and no errors while St. Henry had seven hits and three errors. Aleah Frilling, Clara Gephart, Katelyn DeLoye, Aubrey Baker and Lauren Bergman each had two hits for Fort Loramie. Frilling had two doubles while Gephart, Baker, DeLoye and Lorissa Hoying each had one. Gephart had a team-high 2 RBIs and Gephart, Desiree’ Fogt and Bergman each scored two runs. Frilling picked up the win in the circle. She allowed one earned run in seven innings and had eight strikeouts with one walk. Riverside took an early 5-2 lead and held on to earn a victory in a Northwest Central Conference game on Monday in De Graff. The Pirates had six hits and three errors while Lehman had eight hits and one error. Jalynn Stanley picked up the win in the circle. She pitched six innings and gave up four hits with nine strikeouts and two walks. Stanley was 2 for 3 with 3 RBIs and one walk. She hit a home run, as did Shelby Giles. Giles had 3 RBIs, drew three walks and had three stolen bases. Sierra Snow was 2 for 4 and had 1 RBI. Annie Stiver picked up the loss for Lehman. She allowed eight earned runs in six innings on six hits and eight walks. She had four strikeouts. Grace Brandt was 2 for 3 for the Cavaliers and scored a team-high two runs. Angela Brunner was 2 for 4 and Carly Edwards and Hope Anthony each had a double. Erin Smith hit a double to right field in the bottom of the seventh inning to score two runs and give the Cardinals a 3-2 win over Covington on Monday in a nonconference game in New Bremen. New Bremen had 11 hits and two errors while Covington had two hits and no errors. Smith was 2 for 4 for the Cardinals while Lauren Cordonnier was 2 for 3 with 1 RBI and Hannah Tenkman was 2 for 4. Molly Smith picked up the win on the mound. She pitched a complete game and had five strikeouts and two walks. Versailles defeated Ansonia in run-rule fashion in a home nonconference game on Monday. Versailles got the scoring underway in the bottom of the first with a Caitlyn Luthman two-run single on the way to a four-run first. Versailles added a run in the second while keeping the visitors off the board to lead 5-0 after two innings of play. Luthman, Elli Morris, Abby Stammen and Caitlin McEldowney each picked up an RBI in the bottom of the fourth inning to stretch the team’s lead to 9-0 heading to the fifth inning. After Ansonia scored one run in the top of the fifth, Stammen opened the bottom half with a single to left, McEldowney singled to center and Hannah Barga doubled to center scoring Stammen for a 10-1 score. Versailles earned the win with Faith Huddle grounding to third to score a sliding McEldowney at the plate with the winning run. Lauren Monnin recorded the win for Versailles throwing five innings, allowing one run on four hits, striking out four and walking one. Versailles racked up 14 hits in the game with McEldowney and Barga each collecting three hits. Faith Huddle, Luthman and Stammen each accounted for two hits. Both teams had three errors. Cancelled: Lima Central Catholic at Minster. Sidney scored three runs in the top of the sixth inning to tie it but the Trojans scored one in the seventh to earn a Greater Western Ohio Conference victory on Monday in Sidney. The Yellow Jackets scored three runs on three hits and two walks in the sixth, but Troy came back the next inning scored a run after an error and an RBI double by Blake Snider. Sidney had five hits and three errors while Troy had four hits and one error. Caleb Harris was 2 for 4 for Sidney with 1 RBI and one run. Trey Werntz was 2 for 3 with one walk. EJ Davis stole two bases. Werntz started on the mound and allowed one earned runs on three hits and four walks in five innings with one strikeout. Darius Boeke pitched the last two innings and allowed one unearned run. He had two walks and one strikeout. Luke Foster didn’t give up a hit until the seventh inning as the Wildcats earned a Shelby County Athletic League victory on Monday in Houston. Foster pitched complete game. He had three strikeouts and two walks. The Wildcats had four hits and three errors while Botkins had one error. Houston scored one run in both of the third and fifth innings. John Leist was 2 for 2 with one walk for Houston and had a stolen base. Howie Ludwig was 1 for 1 with two walks, stole one base and scored one run. Ryan Ely scored Houston’s other run. The Jets scored four runs in the fifth inning to cap off a run-rule SCAL victory on Monday in Russia. Fairlawn had 14 hits and no errors while Russia had six hits and one error. Jordan Lessing and Skyler Piper were each 3 for 4 for the Jets. Piper had 2 RBIs and two runs and Lessing had three runs and 1 RBI. Lessing and Kyle Peters each hit a double. Drew Maddy was 3 for 4 (including a home run) with 4 RBIs and Doug Wright was 2 for 3 with two runs. Wright picked up the win. He allowed one earned run in five innings and had three strikeouts. Aiden Shappie was charged with the loss for Russia. He allowed five earned runs on five hits and three walks in 3 1/3 innings and had four strikeouts. Daniel Kearns and Zach Bergman both doubled for the Raiders. Anna pitcher Cole Maurer held Jackson Center to two hits in three innings and didn’t give up a walk to help the Rockets win an SCAL game on Monday in Jackson Center. Anna had eight hits and three errors while Jackson Center had two hits and three errors. Carson Regula picked up the loss for Jackson Center. He allowed one earned run in seven innings and had three strikeouts and two walks. Christopher Elchert and Trevor Sosby had the Tigers’ hits. The Cavaliers took advantage of seven errors by Riverside and earned a Northwest Central Conference win on Monday in De Graff. Lehman had five hits and one error while Riverside had six hits. The Cavaliers scored two runs in each of the first two innings to take control. Jared Magoteaux picked up the win on the mound. He pitched a complete game and gave up one earned run. He had 12 strikeouts and two walks. Jacob Trent was 2 for 4 for Lehman. Mitchell Sollman scored three runs, Drew Barhorst had 3 RBIs and Bryce Kennedy had a double. RJ McGowan was charged with the loss. He allowed two earned runs on three hits in 5 1/3 innings and had three strikeouts with five walks. McGowan was 3 for 3 at the plate with 2 RBIs. Shawnee scored one run on two hits in the bottom of the seventh to hand the Cardinals a loss in a nonconference game on Monday in Lima. New Bremen had 12 hits and four errors while Shawnee had nine hits and one error. Nick Wells was charged with the loss. He gave up one unearned run on three hits and one walk in 2 1/3 innings and had one strikeout. Aaron Vonderhaar was 3 for 4 with 1 RBI while Zach Bertke was 3 for 4 with two runs. Bryce Blickle was 2 for 3 with 1 RBI and Grant Selby was 2 for 3. Patrick Wells hit a double. The Tigers earned a nonconference win on Monday in Versailles. They had eight hits and one error while Celina had six hits and two errors. Celina took a 1-0 lead in the first inning but the Tigers scored two in the fourth and four in the sixth to earn the win. Andrew DeMange and Zach Griesdorn both had two hits for Versailles. Ryan Martin hit a double. Martin picked up the win on the mound. He allowed one earned run on four hits and one walk and five innings and struck out two batters. The Yellow Jackets earned a nonconference win on Monday in Kettering thanks to strong performances by singles players. Prem Dev won 6-1, 6-1 at first singles while Grant Hoying won by two 6-1 scores at second singles. Akansh Mani won 6-1, 3-0 (retired, injury) at third singles. Jersain Brux and Broc Bey lost 6-1, 6-3 at first doubles and TJ Leonard and Nobel Zhou lost 6-2, 6-3 at second doubles. Tippecanoe won its sixth straight, with five of those wins being sweeps, on the road Monday in Sidney. At first singles, Tippecanoe’s Colin Achterberg defeated Lehman’s Danny Lins 6-1, 6-2. At second singles, Christopher Nichols defeated Sam Gilardi 6-0, 6-2. At third singles, Blake Moran defeated Max Schmiesing 6-1, 6-1. Riverside competed in a tri-meet with Bellefontaine at Urbana on Monday. The girls squad had four first-place finishes, led by Lauren Sanford. She broke a school record in high jump with a leap of 5-3 and finished first in the 400 meter dash. Irene Winner was first in the 3,200 run. Winner along with Sanford, Alaina Heath and Alli Knight won the 800 relay. For the boys squad, Derrick Cotterman finished first in high jump. Sidney’s Hallie Westerbeck catches a popup during a Greater Western Ohio Conference game against Troy on Monday. 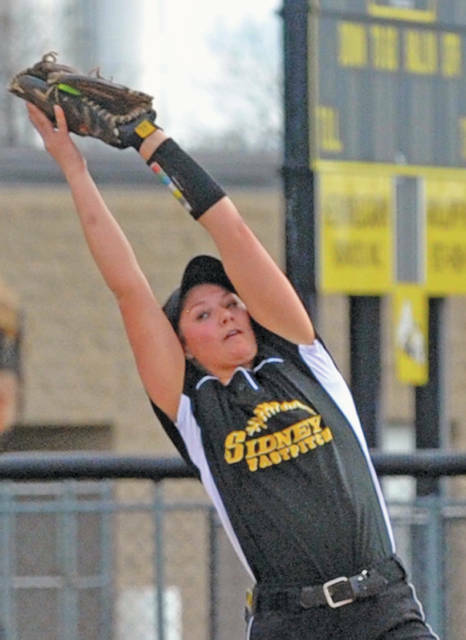 Sidney’s McKenzie Benshoff catches a popup during a Greater Western Ohio Conference game against Troy on Monday.